It’s true that energy can neither be created nor be destroyed. But the sources from which energy (electricity) is harnessed is getting depleted day by day. Hence the need to generate the above is necessary and one such way to do so is by the use of Petlier Bands. The lower part of the band consists of Petlier tiles, a thermo-electric device, having direct contact with our body. The tile is connected to a boost regulator which is in turn connected to the battery that is placed above the band. The battery is connected to the switch which leads to the USB module form where current is produced. All the components are connected in series with each other. ​The Petlier Band is worn in our body. Here the electricity is being drawn from our body heat which is absorbed by the Petlier tiles. The purpose of these tiles is to convert the body heat in to electricity which is then transferred to the boost regulator where the electric DC current is boosted to higher amperes. The boosted current is then absorbed by the battery. 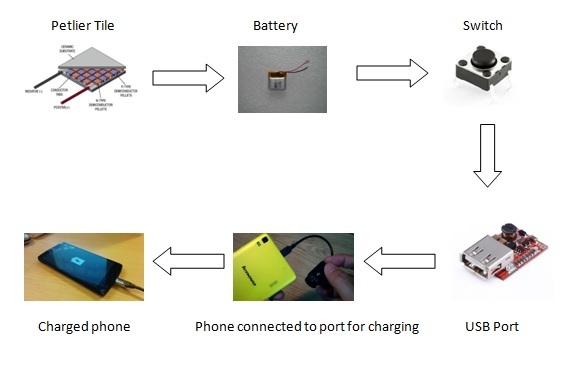 By switching on the switch, which is connected to the battery, current is passed through the USB module and thus any device can be charged ,by plugging it in to the USB port.